A university in Devon is preparing to find out if a baby robot can be taught to talk. 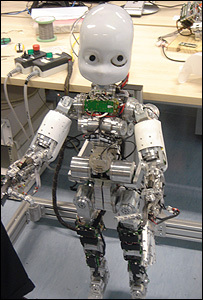 Staff at the University of Plymouth will work with a 1m-high (3ft) humanoid baby robot called iCub. The project is believed to be the first of its kind in the world and typical experiments with the iCub robot will include activities such as inserting objects of various shapes into the corresponding holes in a box, serialising nested cups and stacking wooden blocks. The iCub, which will arrive at the university next year, will also be asked to name objects and actions so that it acquires basic phrases such as "robot puts stick on cube". A consortium led by the University of Plymouth, a world leader in cognitive robotics research, beat competition from 31 others to win a £4.7m grant for the Italk - Integration and Transfer of Action and Language Knowledge in Robots - project. The university's partners in the project include the University of Hertfordshire and others from across Europe. Angelo Cangelosi, Professor in Artificial Intelligence said: "The outcome of the research will define the scientific and technological requirements for the design of humanoid robots able to develop complex behavioural, thinking and communication skills through individual and social learning."